This article is about vinyl records. For music albums in general, see Album. "Long play" and "Long Player" redirect here. For the video format, see Long play (VCR format). For video game playthroughs, see Longplay (video games). For the album by the Faces, see Long Player (album). The LP (from "long playing" or "long play") is an analog sound storage medium, a vinyl record format characterized by a speed of ​33 1⁄3 rpm, a 12- or 10-inch (30- or 25-cm) diameter, and use of the "microgroove" groove specification. Introduced by Columbia in 1948, it was soon adopted as a new standard by the entire record industry. Apart from a few relatively minor refinements and the important later addition of stereophonic sound, it has remained the standard format for vinyl albums. At the time the LP was introduced, nearly all phonograph records for home use were made of an abrasive (and therefore noisy) shellac compound, employed a much larger groove, and played at approximately 78 revolutions per minute (rpm), limiting the playing time of a 12-inch diameter record to less than five minutes per side. The new product was a 12- or 10-inch (30 or 25 cm) fine-grooved disc made of PVC ("vinyl") and played with a smaller-tipped "microgroove" stylus at a speed of ​33 1⁄3 rpm. Each side of a 12-inch LP could play for about 22 minutes. Only the microgroove standard was new, as both vinyl and the ​33 1⁄3 rpm speed had been used for special purposes for many years, as well as in one unsuccessful earlier attempt to introduce a long-playing record for home use by RCA Victor. Although the LP was suited to classical music because of its extended continuous playing time, it also allowed a collection of ten or more pop music recordings to be put on a single disc. Previously, such collections, as well as longer classical music broken up into several parts, had been sold as sets of 78 rpm records in a specially imprinted "record album" consisting of individual record sleeves bound together in book form. The use of the word "album" persisted for the one-disc LP equivalent. The prototype of the LP was the soundtrack disc used by the Vitaphone motion picture sound system, developed by Western Electric and introduced in 1926. For soundtrack purposes, the less than five minutes of playing time of each side of a conventional 12-inch 78 rpm disc was not acceptable. The sound had to play continuously for at least 11 minutes, long enough to accompany a full 1,000-foot (300 m) reel of 35 mm film projected at 24 frames per second. The disc diameter was increased to 16 inches (40 cm) and the speed was reduced to ​33 1⁄3 revolutions per minute. Unlike their smaller LP descendants, they were made with the same large "standard groove" used by 78s. Unlike conventional records, the groove started at the inside of the recorded area near the label and proceeded outward toward the edge. Like 78s, early soundtrack discs were pressed in an abrasive shellac compound and played with a single-use steel needle held in a massive electromagnetic pickup with a tracking force of five ounces (1.4 N). By mid-1931, all motion picture studios were recording on optical soundtracks, but sets of soundtrack discs, mastered by dubbing from the optical tracks and scaled down to 12 inches to cut costs, were made as late as 1936 for distribution to theaters still equipped with disc-only sound projectors. Syndicated radio programming was distributed on 78 rpm discs beginning in 1928. The desirability of longer continuous playing time soon led to the adoption of the Vitaphone soundtrack disc format. 16-inch ​33 1⁄3 rpm discs playing about 15 minutes per side were used for most of these "electrical transcriptions" beginning about 1930. Transcriptions were variously recorded inside out like soundtrack discs (in the era of shellac pressings and steel needles, needle wear considerations dictated an inside start for such a long recording) or with an outside start. Longer programs, which required several disc sides, pioneered the system of recording odd-numbered sides inside-out and even-numbered sides outside-in so that the sound quality would match from the end of one side to the start of the next. Although a pair of turntables was used, to avoid any pauses for disc-flipping, the sides had to be pressed in a hybrid of manual and automatic sequencing, arranged in such a manner that no disc being played had to be turned over to play the next side in the sequence. Instead of a three-disc set having the 1–2, 3–4 and 5–6 manual sequence, or the 1–6, 2–5 and 3–4 automatic sequence for use with a drop-type mechanical record changer, broadcast sequence would couple the sides as 1–4, 2–5 and 3–6. Some transcriptions were recorded with a vertically modulated "hill and dale" groove. This was found to allow deeper bass (because turntable rumble was laterally modulated in early radio station turntables) and also an extension of the high-end frequency response. Neither of these was necessarily a great advantage in practice because of the limitations of AM broadcasting. Today we can enjoy the benefits of those higher-fidelity recordings, even if the original radio audiences could not. Initially, transcription discs were pressed only in shellac, but by 1932 pressings in RCA Victor's vinyl-based "Victrolac" were appearing. Other plastics were sometimes used. By the late 1930s, vinyl was standard for nearly all kinds of pressed discs except ordinary commercial 78s, which continued to be made of shellac. Beginning in the mid-1930s, one-off 16-inch ​33 1⁄3 rpm lacquer discs were used by radio networks to archive recordings of their live broadcasts, and by local stations to delay the broadcast of network programming or to prerecord their own productions. In the late 1940s, magnetic tape recorders were adopted by the networks to pre-record shows or repeat them for airing in different time zones, but 16-inch vinyl pressings continued to be used into the early 1960s for non-network distribution of prerecorded programming. Use of the LP's microgroove standard began in the late 1950s, and in the 1960s the discs were reduced to 12 inches, becoming physically indistinguishable from ordinary LPs. Unless the quantity required was very small, pressed discs were a more economical medium for distributing high-quality audio than tape, and CD mastering was, in the early years of that technology, very expensive, so the use of LP-format transcription discs continued into the 1990s. The King Biscuit Flower Hour is a late example, as are Westwood One's The Beatle Years and Doctor Demento programs, which were sent to stations on LP at least through 1992. RCA Victor introduced an early version of a long-playing record for home use in September 1931. These "Program Transcription" discs, as Victor called them, played at ​33 1⁄3 rpm and used a somewhat finer and more closely spaced groove than typical 78s. They were to be played with a special "Chromium Orange" chrome-plated steel needle. The 10-inch discs, mostly used for popular and light classical music, were normally pressed in shellac, but the 12-inch discs, mostly used for "serious" classical music, were normally pressed in Victor's new vinyl-based Victrolac compound, which provided a much quieter playing surface. They could hold up to 15 minutes per side. Beethoven's Fifth Symphony, performed by the Philadelphia Orchestra under Leopold Stokowski, was the first 12-inch recording issued. The New York Times wrote, "What we were not prepared for was the quality of reproduction...incomparably fuller." Unfortunately for Victor, it was downhill from there. Many of the subsequent issues were not new recordings but simply dubs made from existing 78 rpm record sets. The dubs were audibly inferior to the original 78s. Two-speed turntables with the ​33 1⁄3 rpm speed were included only on expensive high-end machines, which sold in small numbers, and people were not buying many records of any kind at the time. Record sales in the US had dropped from a high of 105.6 million records sold in 1921 to 5.5 million in 1933 because of competition from radio and the effects of the Great Depression. Few if any new Program Transcriptions were recorded after 1933, and two-speed turntables soon disappeared from consumer products. Except for a few recordings of background music for funeral parlors, the last of the issued titles had been purged from the company's record catalog by the end of the decade. The failure of the new product left RCA Victor with a low opinion of the prospects for any sort of long-playing record, influencing product development decisions during the coming decade. CBS Laboratories head research scientist Peter Goldmark led Columbia's team to develop a phonograph record that would hold at least 20 minutes per side. Although Goldmark was the chief scientist who selected the team, he delegated most of the experimental work to William S. Bachman, whom Goldmark had lured from General Electric, and Howard H. Scott, who died September 22, 2012, at the age of 92. Research began in 1941, was suspended during World War II, and then resumed in 1945. Columbia Records unveiled the LP at a press conference in the Waldorf Astoria on June 18, 1948, in two formats: 10 inches (25 centimetres) in diameter, matching that of 78 rpm singles, and 12 inches (30 centimetres) in diameter. The initial release of 133 recordings were: 85 12-inch classical LPs (ML 4001 to 4085), 26 10-inch classics (ML 2001 to 2026), eighteen 10-inch popular numbers (CL 6001 to 6018), and four 10-inch juvenile records (JL 8001 to 8004). According to the 1949 Columbia catalog, issued September 1948, the first twelve-inch LP was Mendelssohn's Concerto in E Minor by Nathan Milstein on the violin with the New York Philharmonic, conducted by Bruno Walter (ML 4001). Three ten-inch series were released: 'popular', starting with the reissue of The Voice of Frank Sinatra (CL 6001); 'classical', numbering from Beethoven's 8th symphony (ML 2001), and 'juvenile', commencing with Nursery Songs by Gene Kelly (JL 8001). Also released at this time were a pair of 2-LP sets, Puccini's La Bohème (SL-1) and Humperdinck's Hansel & Gretel (SL-2). When the LP was introduced in 1948, the 78 was the conventional format for phonograph records. By 1952, 78s still accounted for slightly more than half of the units sold in the United States, and just under half of the dollar sales. The 45, oriented toward the single song, accounted for just over 30% of unit sales and just over 25% of dollar sales. The LP represented not quite 17% of unit sales and just over 26% of dollar sales. Ten years after their introduction, the share of unit sales for LPs in the US was almost 25%, and of dollar sales 58%. Most of the remainder was taken up by the 45; 78s accounted for only 2% of unit sales and 1% of dollar sales. For this reason, major labels in the United States ceased manufacturing of 78s for popular and classical releases in 1956 with the minor labels following suit, with the final US-made 78 being produced in 1959. Canada and the UK continued production into 1960, while India, the Philippines, and South Africa produced 78s until 1965, with the last holdout, Argentina, continuing until 1970. The popularity of the LP ushered in the "Album Era" of English-language popular music, beginning in the 1960s, as performers took advantage of the longer playing time to create coherent themes or concept albums. "The rise of the LP as a form—as an artistic entity, as they used to say—has complicated how we perceive and remember what was once the most evanescent of the arts", Robert Christgau wrote in Christgau's Record Guide: Rock Albums of the Seventies (1981). "The album may prove a '70s totem—briefer configurations were making a comeback by decade's end. But for the '70s it will remain the basic musical unit, and that's OK with me. I've found over the years that the long-playing record, with its twenty-minute sides and four-to-six compositions/performances per side, suits my habits of concentration perfectly." Although the popularity of LPs began to decline in the late 1970s with the advent of Compact Cassettes, and later compact discs, the LP survives as a format to the present day. Vinyl LP records enjoyed a resurgence in the early 2010s. Vinyl sales in the UK reached 2.8 million in 2012. US vinyl sales in 2017 reached 15.6 million and 16.7 million for 2018. The LP was soon confronted by the "45", a 7-inch (180 mm) diameter fine-grooved vinyl record playing at 45 rpm. It was introduced by RCA Victor in 1949. To compete with the LP, boxed albums of 45s were issued, along with EP (Extended Play) 45s, which squeezed two or even three selections onto each side. Despite these efforts, the 45 succeeded only in replacing the 78 as the format for singles. The "last hurrah" for the 78 rpm record in the US was the microgroove 78 series pressed for the Audiophile label (Ewing Nunn, Saukville, Wis.) in the early 1950s. This series was labeled AP-1 through about AP-40, pressed on grainless red vinyl. Today AP-1 through AP-5 are very scarce. By very tightly packing the fine groove, a playing time of 17 minutes per side was achieved. Within a couple of years Audiophile switched to ​33 1⁄3. Reel-to-reel magnetic tape recorders posed a new challenge to the LP in the 1950s, but the higher cost of pre-recorded tapes was one of several factors that confined tape to a niche market. Cartridge and cassette tapes were more convenient and less expensive than reel-to-reel tapes, and they became popular for use in automobiles beginning in the mid-1960s. However, the LP was not seriously challenged as the primary medium for listening to recorded music at home until the 1970s, when the audio quality of the cassette was greatly improved by better tape formulations and noise-reduction systems. By 1983, cassettes were outselling LPs in the US. The Compact Disc (CD) was introduced in 1982. It offered a recording that was, theoretically, completely noiseless and not audibly degraded by repeated playing or slight scuffs and scratches. At first, the much higher prices of CDs and CD players limited their target market to affluent early adopters and audiophiles. But prices came down, and by 1988 CDs outsold LPs. The CD became the top-selling format, over cassettes, in 1992. Along with phonograph records in other formats, some of which were made of other materials, LPs are now widely referred to simply as "vinyl". Since the late 1990s there has been a renewed interest in vinyl. Demand has increased in niche markets, particularly among audiophiles, DJs, and fans of indie music, but most music sales as of 2018 come from CDs and online downloads/streams because of their availability, convenience, and price. When initially introduced, 12-inch LPs played for a maximum of 45 minutes, divided over two sides, with 10-inch versions carrying a maximum of 35 minutes again over two sides. With the advent of sound film or "talkies," the need for greater storage space made ​33 1⁄3 rpm records more appealing. Soundtracks could no longer fit onto the mere 5 minutes per side that 78s offered. They were not an immediate success, however, as they were released during the height of the Great Depression, and seemed frivolous to the many impoverished of the time. It wasn't until "microgroove" was developed by Columbia Records in 1948 that Long Players (LPs) reached their maximum playtime that has continued to modern times. Owing to marketing attitudes at the time, the 12-inch format was reserved solely for higher-priced classical recordings and Broadway shows. Popular music appeared only on 10-inch records. Executives believed classical music fans would be eager to hear a Beethoven symphony or a Mozart concerto without having to flip over multiple, four-minute-per-side 78s, and that pop music fans, who were used to listening to one song at a time, would find the shorter time of the 10-inch LP sufficient. Their beliefs were wrong. By the mid-1950s, the 10-inch LP, like its similarly sized 78 , would lose the format war and be discontinued. Ten-inch records reappeared as Mini-LPs in the late 1970s and early 1980s in the United States and Australia as a marketing alternative. In 1952, Columbia Records introduced "extended-play" LPs that played for as long as 52 minutes, or 26 minutes per side. These were used mainly for the original cast albums of Broadway musicals, such as Kiss Me, Kate and My Fair Lady, or to fit an entire play, such as the 1950 production of Don Juan in Hell, onto two LPs. The 52-minute playing time remained rare, however, because of mastering limitations, and most LPs continued to be issued with a 30- to 45-minute playing time. A small number of albums exceeded the 52-minute limit. But these records had to be cut with much narrower spacing between the grooves, which allowed for a smaller dynamic range on the records, and meant that playing the record with a worn needle could damage the record. It also resulted in a much quieter sound. The list of long-playing vinyl records includes the 90-minute 1976 LP 90 Minutes with Arthur Fiedler and the Boston Pops, made by Radio Shack; Genesis' Duke, with each side exceeding 27 minutes; Bob Dylan's 1976 album Desire, with side two lasting almost thirty minutes; Todd Rundgren's 1975 album Initiation, totaling 67 min 32 s over two sides; and André Previn's Previn Plays Gershwin,, with the London Symphony Orchestra, whose sides each exceeded 30 minutes. Finally, several recordings of Beethoven's Ninth Symphony were reissued on single discs; these LPs contained about 35 minutes on each side, with the third movement split into two parts. Spoken word and comedy albums require a smaller dynamic range compared to musical records. Therefore, they can be cut with narrower spaces between the grooves. The Comic Strip, released by Springtime Records in 1981, has a side A lasting 38 min 4 s and a side B lasting 31 min 8 s, for a total of 69 min 12 s.
In any case, the standard 45-minute playing time of the LP was a significant improvement over that of the previous dominant format, the 78 rpm single, which was generally limited to three to four minutes. At around 14 minutes per side for 10-inch and 23 minutes per side for 12-inch, LPs provided a satisfactory time to enjoy a recording before needing to change or turn over a disc. Turntables called record changers could play records stacked vertically on a spindle. This arrangement encouraged the production of multiple-record sets in automatic sequence. A two-record set had Side 1 and Side 4 on one record, and Side 2 and Side 3 on the other, so the first two sides could play in a changer without the listener's intervention. Then the stack was flipped over. Larger boxed sets used appropriate automatic sequencing (1–8, 2–7, 3–6, 4–5) to allow continuous playback, but this created difficulties when searching for an individual track. Vinyl records are vulnerable to dust, heat warping, scuffs, and scratches. Dust in the groove is usually heard as noise and may be ground into the vinyl by the passing stylus, causing lasting damage. A warp can cause a regular "wow" or fluctuation of musical pitch, and if substantial it can make a record physically unplayable. A scuff will be heard as a swishing sound. A scratch will create an audible tick or pop once each revolution when the stylus encounters it. A deep scratch can throw the stylus out of the groove; if it jumps to a place farther inward, part of the recording is skipped; if it jumps outward to a part of the groove it just finished playing, it can get stuck in an infinite loop, playing the same bit over and over until someone stops it. This last type of mishap, which in the era of brittle shellac records was more commonly caused by a crack, spawned the simile "like a broken record" to refer to annoying and seemingly endless repetition. 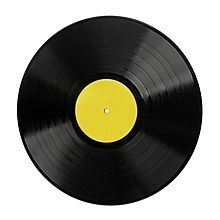 Records used in radio stations can suffer cue burn, which results from disc jockeys placing the needle at the beginning of a track, turning the record back and forth to find the exact start of the music, then backing up about a quarter turn, so that when it is released the music will start immediately after the fraction of a second needed for the disc to come up to full speed. When this is done repeatedly, the affected part of the groove is heavily worn and a hissing sound will be noticeable at the start of the track. The process of playing a vinyl record with a stylus is by its very nature to some degree a destructive process. Wear to either the stylus or the vinyl results in diminished sound quality. Record wear can be reduced to virtual insignificance, however, by the use of a high-quality, correctly adjusted turntable and tonearm, a high-compliance magnetic cartridge with a high-end stylus in good condition, and careful record handling, with non-abrasive removal of dust before playing and other cleaning if necessary. The average LP has about 1,500 feet (460 m; 0.28 mi) of groove on each side. The average tangential needle speed relative to the disc surface is approximately 1 mile per hour (1.6 km/h; 0.45 m/s). It travels fastest on the outside edge, unlike audio CDs, which change their speed of rotation to provide constant linear velocity (CLV). (By contrast, CDs play from the inner radius outward, the reverse of phonograph records.) Thin, closely spaced spiral grooves that allowed for increased playing time on a ​33 1⁄3 rpm microgroove LP led to a faint pre-echo warning of upcoming loud sounds. The cutting stylus unavoidably transferred some of the subsequent groove wall's impulse signal into the previous groove wall. It was discernible by some listeners throughout certain recordings but a quiet passage followed by a loud sound would allow anyone to hear a faint pre-echo of the loud sound occurring 1.8 seconds ahead of time. This problem could also appear as post-echo, with a ghost of the sound arriving 1.8 seconds after its main impulse. Pre- and post-echo can be avoided by the use of direct metal mastering. The first LP records introduced used fixed pitch grooves just like their 78 predecessors. The use of magnetic tape for the production of the master recordings allowed the introduction of variable pitch grooves. The magnetic tape reproducer used to transfer the recording to the master disc was equipped with an auxiliary playback head positioned ahead of the main head by a distance equal to one revolution of the disc. The sole purpose of this head was to monitor the amplitude of the recording. If the sound level from both the auxiliary and main magnetic heads was loud, the cutting head on the disc recording lathe was driven at its normal speed. However, if the sound level from both magnetic heads was quieter, then the disc cutting head could be driven at a lower speed reducing the groove pitch with no danger of the adjacent grooves colliding with each other. The playing time of the disc was therefore increased by an amount dependent on the duration of quieter passages. The record manufacturers had also realised that by reducing the amplitude of the lower frequencies recorded in the groove, it was possible to decrease the spacing between the grooves and further increase the playing time. These low frequencies were then restored to their original level on playback. Further, if the amplitude of the high frequencies was artificially boosted on recording the disc and then subsequently reduced to their original level on playback, the noise introduced by the disc would be reduced by a similar amount. This gave rise to an equalisation frequency response applied during record coupled with an inverse of the response applied on playback. Each disc manufacturer applied their own version of an equalisation curve (mostly because each manufacturer's equalisation curve was protected by interlocking patents). Low-end reproduction equipment applied a compromise playback equalisation that reproduced most discs reasonably well. However, amplifiers for audiophile equipment were equipped with an equalisation selector with a position for most, if not all, disc manufacturers. The net effect of equalization is to allow longer playing time and lower background noise while maintaining full fidelity of music or other content. In 1954, the Recording Industry Association of America (RIAA) introduced a standard equalisation curve to be used by all record manufacturers. Consequently, both low-quality and audiophile reproducers alike could replay any recording with the correct equalisation. There are two versions of the reproduction RIAA equalisation curve. The first, is simply the inverse of the recording curve designed for cheaper equipment using crystal or ceramic reproduction cartridges. The second curve is intended for equipment fitted with magnetic reproduction cartridges where the output voltage is dependent on the frequency of the recorded signal (the voltage output is directly proportional to the frequency of the recorded signal; that is: the voltage doubles as the recorded frequency doubles). LPs pressed in multicolored vinyl (Sotano Beat: A Todo Color, a various-artists compilation) and clear yellow vinyl - (Rock On Elvis by Tulsa McLean) both from Argentina. The audio quality of LPs has increased greatly since their 1948 inception. While early LP recordings were monophonic, stereophony had been demonstrated in 1881 and Alan Blumlein had patented Stereophonic sound in 1931. Unsuccessful attempts were made to create stereophonic records starting in the 1920s, including Emory Cook's 1952 "binaural" LPs using two precisely spaced tracks on the record (one track for each channel) which had to be played with two monaural pick-ups on a tuning-fork-shaped tonearm. The modern system ultimately released by Audio Fidelity Records in November 1957 uses two modulation angles, equal and opposite 45 degrees from vertical (and so perpendicular to each other.) It can also be thought of as using traditional horizontal modulation for the sum of left and right channels (mono), making it essentially compatible with simple mono recordings, and vertical-plane modulation for the difference of the two channels. In the 1970s, quadraphonic sound (four-channel) records became available in both discrete and matrix formats. These did not achieve the popularity of stereo records due to the expense of consumer playback equipment, competing and incompatible quad recording standards, and a lack of quality in quad-remix releases. Quad never escaped the reputation of being a gimmick, and the various (mutually incompatible) discrete surround solutions required an ultrasonic carrier signal that was technically difficult to capture and suffered degradation with playing. With the advent of DVD-Audio and Super Audio CD, multi-channel recordings once favored and championed by artists like Leopold Stokowski and Glenn Gould have made a modest comeback. In addition, new surround recordings have been made for these formats and Blu-ray Audio. In the later 1970s, engineers Gerry Block and Burgess Macneal devised a preview system of mastering vinyl which allowed about 10-20% more music per disc while not sacrificing dynamic range. The preview tape head was positioned far enough before the program tape head to allow the disk computer enough time to measure the peaks in low frequency and thereby expand the feed appropriately for the greater excursions of groove modulation they produce. The Compudisk system was unveiled at the 1980 AES Convention, alongside the Zuma Disk Computer (made by John W. Bittner) and the Neumann VMS-80 lathe, which had its own advanced disk computer. The composition of vinyl used to press records (a blend of polyvinyl chloride and polyvinyl acetate) has varied considerably over the years. Virgin vinyl is preferred, but during the 1970s energy crisis, it became commonplace to use recycled vinyl. Sound quality suffered, with increased ticks, pops, and other surface noises. Other experiments included reducing the thickness of LPs, leading to warping and increased susceptibility to damage. Using a biscuit of 130 grams of vinyl had been the standard. Compare these to the original Columbia 12-inch LPs (ML 4001) at around 220 grams each. Besides the standard black vinyl, specialty records are also pressed on different colors of PVC/A or picture discs with a card picture sandwiched between two clear sides. Records in different novelty shapes have also been produced. In 2018, an Austrian startup received funding to develop high definition vinyl records that purport to contain longer play times, louder volumes and higher fidelity than conventional vinyl LPs. The HD process works by converting audio to a digital 3D topography map which is then inscribed onto the vinyl stamper via lasers, resulting in less loss of information. Many critics have expressed skepticism regarding the cost and quality of HD records. Disc jockeys (or DJs) in clubs still rely heavily on vinyl records, as cueing tracks from cassette tapes is too slow and CDs did not allow creative playback options until quite recently.[when?] The term "DJ", which had always meant a person who played various pieces of music on the radio (originally 78s, then 45s, then tape cartridges and reels; now cuts from CDs or tracks on a computer) – a play on the horse-racing term "jockey" – has also come to encompass all kinds of skills in "scratching" (record playback manipulation) and mixing dance music, rapping over the music or even playing musical instruments, but the original dance club (non-radio) definition was simply somebody who played records, alternating between two turntables. The skill came in subtly matching beats or instruments from one song to the next, providing a consistent dance tempo. DJs also made occasional announcements and chatted with patrons to take requests while songs were actually playing, similar to what radio disc jockeys have been doing since the 1940s. ^ "Origin of LP". merriam-webster.com. ^ "Full-length LP records on 150 and 180 gram vinyl". Standard Vinyl. Standard Vinyl. Retrieved December 18, 2018. ^ "Frequently Asked Questions". The Vitaphone Project. Retrieved 2011-08-12. ^ "Rand's Esoteric OTR: Types of transcriptions and radio recordings". Randsesotericotr.podbean.com. Retrieved August 12, 2011. ^ "Phonograph Disks Run for Half-Hour". The New York Times. September 18, 1931. p. 48. Retrieved November 25, 2012. ^ Compton Pakenham (September 20, 1931). "Newly Recorded Music". The New York Times. p. X10. ^ "Not So New", The Billboard, June 5, 1948, p. 17. ^ a b Robert Shelton (March 16, 1958). "Happy Tunes on Cash Registers". The New York Times. p. XX14. ^ Goldmark, Peter. Maverick inventor; My Turbulent Years at CBS. New York: Saturday Review Press, 1973. ^ "Columbia Diskery, CBS Show Microgroove Platters to Press; Tell How It Began", Billboard, June 26, 1948, p. 3. ^ Marmorstein, Gary. The Label: The Story of Columbia Records. New York: Thunder's Mouth Press; p. 165. ^ "78 Speed On Way Out; LP-45 Trend Gaining", The Billboard, August 2, 1952, p. 47. ^ Kornelis, Chris (27 January 2015). "Why CDs May Actually Sound Better Than Vinyl". L.A. Weekly. ^ a b "Statistical Overview". riaa.com. Archived from the original on December 10, 1997. Retrieved December 31, 2016. ^ McGeehan, Patrick (December 7, 2009). "Vinyl Records and Turntables Are Gaining Sales". The New York Times. Retrieved May 11, 2010. ^ "Why Do Records Spin at 33 1/3 RPM?". The Sound of Vinyl Blog. ^ "10-inch LP (1948 – 1980s) – Museum Of Obsolete Media". www.obsoletemedia.org. ^ London Symphony Orchestra, Previn Plays Gershwin, André Previn, pianist and conductor (featuring Rhapsody in Blue, An American in Paris and the Concerto in F for Piano and Orchestra), Angel SFO 36810, circa 1979. ^ "Pre-echo when recording vinyl record". Audacity Forum. Archived from the original (Forum Discussion) on 2009-06-09. ^ "Analog Quadraphonic Formats". Retrieved 8 April 2015. ^ Adrian Hope (24 January 1980). "Pressing Problems for a Record Future". New Scientist. p. 229 ff. ^ Hogan, Marc (April 11, 2018). ""High Definition Vinyl" Is Happening, Possibly as Early as Next Year". Pitchfork. Retrieved December 17, 2018. ^ Seppala, Timothy J. (April 26, 2018). "HD vinyl is a promise, not a product". Endgadget. Retrieved December 17, 2018. This page was last edited on 6 April 2019, at 14:03 (UTC).